This is West Australian Parliament House in Perth, built between 1902 and 1904. 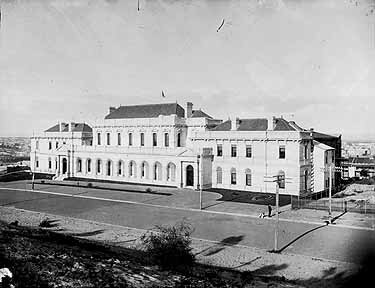 Parliament House is located on Harvest Terrace; this is one of the early photos. For us at Project SafeCom, it ain't looking good for the Geoff Gallup State government in Western Australia. The Gallup government seems to believe in the doctrine of "don't mention the refugees". Harmony Week, the extended West Australian version of the federally celebrated "Living in Harmony Day" is a sanitised self-promotion stint constructed by premier Geoff Gallup, says West Australian refugee group Project SafeCom, and it adds that in WA it should be renamed the "Don't Mention The Refugees Day". March 21, the anniversary of the Sharpeville massacre under the apartheid regime in South Africa, is called the "United Nations International Day for the Elimination of Racism" - by many UN member countries, but not in Australia, by deliberate design. On 21 March 1960 police opened fire and killed 69 people at a peaceful demonstration against apartheid in Sharpeville, South Africa. In Australia however, the day was nominated as "Living in Harmony Day" or "Harmony Day", and it was deliberately not called the United Nations International Day for the Elimination of Racism. The Federal government basically refused to honor this day, and instead announced that it would create the Harmony Day, and the only concession given to the UN proposal was "that it would coincide" with the International Day for the Elimination of Racism by organising its Harmony Day also on 21 March. "There is an eery silence on refugees and asylum seekers in the West Australian government, and the only public record of Geoff Gallup speaking out on asylum seekers or refugees is from New Year 2003, when he orchestrated a media conference, proffering his opinion about the fires and incidents in the Baxter detention centre in South Australia, where he used the opportunity to push an inappropriate Law and Order line about an issue that did not even concern him because it did not take place in his home state", Project SafeCom's spokesman Jack Smit commented. "We have no record of criticism of the appalling human rights breaches of the Federal policies, we have never heard Geoff Gallup saying anything, or doing anything. It seems that celebration of his own profile has a higher priority in his attitude and speaking out, or the lack of it, on asylum seekers and the disgraceful way Australia treats them." Most of the Australian detention centres are located within WA's State boundaries: formerly there was the Curtin detention centre, there is the Port Hedland detention centre, there is the Christmas Island detention centre, and the Perth detention centre at Perth airport, and federal plans have been drafted for another detention centre in the Kimberley region of Western Australia. "Western Australia is also on the record as the worst service provider for refugees on Temporary Protection Visas, comparable with the other States: WA only provides one out of eight identified services, Rental Bond Loans. "When Gallup won the election, he was elected on a Social justice platform, but right at the start he sidelined the high-profile and outspoken acting Equal Opportunities Commissioner Moira Rayner, who was determined and vocal about Aboriginal issues, vested the Multicultural Affairs department within the Department of Premier and Cabinet as the Office of Multicultural Interests, he appointed another Equal Opportunities Commissioner and made himself the Minister." "With Australia's appalling asylum seeker policies, that has permanently damaged thousands of people 'who had the temerity to seek asylum in Australia' nobody can celebrate Harmony Day - because there is no harmony when we deliberately, by design, have a policy of racism and exclusion reserved for asylum seekers. "The same federal government that creates Harmony Day, keeps vilifying asylum seekers by calling them "illegal entrants" and "unauthorised arrivals". This is the designed disgrace of Australia. And the Western Australian government is co-complicit of this policy". "There is a lot of racism in Australia, also in Western Australia, and it should not be forgotten that the best Geoff Gallup can come up with for young Aboriginal children in the inner city suburb of Northbridge is a curfew. This curfew is indeed proof of the racism in WA. We have a good reason to not mention the word "Racism" in the naming of Australia's version of the United Nations International Day for the Elimination of Racism."